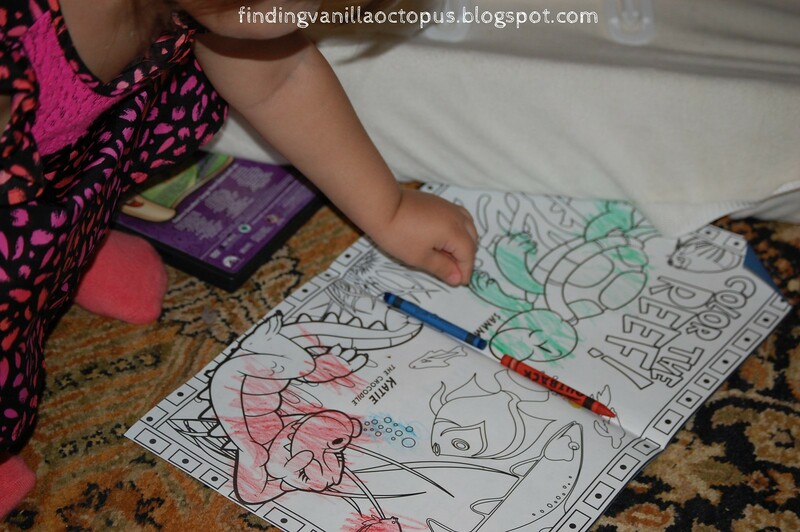 Finding Vanilla Octopus: Preschool Schmeeschool, Right? As the inevitable "First Day of" pictures have gone up on Facebook, I've succumbed to feeling a bit of guilt over the fact that Abby is not among the masses starting preschool this year. I worry a bit that she'll get left behind in some ways, that she's missing out on a rather unique experience (school is serious business these days, so Kindergarten won't likely be nearly so chock-full of pure fun), that she's being denied a major rite of passage. After all, I went to preschool, as did my brothers before me and my sister after. I don't have many memories of the experience, but I have some, and they are fond ones. Almost all of Abby's playgroup mates have set off with backpacks and packed lunches; some with smiles and some with tears, but all destined for a great adventure. I can't even get Abby out the front door most days. That's something that I'm hoping will change with time, as both she and Michael become more independent and I'm less overly stretched in every direction. I used to think that getting myself put together was hard work. Now I'm responsible for taking over the responsibility of three other people before I even get to me. However, one thing I can rest easy about is that Abby is learning plenty of things around here, with great ease. She can sing the alphabet and identify all of the letters. She knows the sounds that many of them make. Though she gets confused between thirteen and seventeen, she can almost count to twenty. She can dress and undress herself. She's getting pretty good at hand-washing and teeth-brushing. She's actually coloring in the objects on the page, rather than randomly scribbling. As I've mentioned before, though I've yet to have the chance to give her letter sheets to trace, she's also figured out how to draw L's and T's. As for her social skills, I don't suppose any two-year-old really has good ones, no matter the circumstances. She often gets rough with her brother, but they have a long history of such physicality in their relationship, and -truth be told- he quite often plays the role of "annoying little brother" a bit too well. However, she's pretty good with him most of the time, and very recently has showed an impressive amount of interest in and support of his fledgling forays into verbal communication. She often gets him to try new words when I cannot, and praises him enthusiastically for doing so. What has really blown me away, however, is how wonderful she is with her little sister. I was able to leave Mia downstairs in her rocker, with little concern, while putting Michael down for his nap today because Abby was on the job. All I had to do was turn Mia towards her older sister and instruct, "Abby, make sillies for Mia," and the laughter had begun before I got to the next room. So, really, what I've got here is a fantastic girl who's got letters, numbers, personal care tasks, and social skills in the bag. She's going to end up being short on familiarity with institutional-style structure when she finally starts school, but I'm sure she'll adapt quickly enough. I suppose it's only me who really feels a loss in all of this. Loss of an expectation which our financial reality can't support. Loss of an opportunity to have my hands a little less full for a couple of mornings a week (though, to be fair, the trade-off would be quite a bit of commuting that we otherwise don't have to bother with). As for Abby, she's right at home here with her mommy, her daddy, and her little brother and sister. That's a really good thing, no doubt about it.